FEBRUARY 24, 2014 — Patrick Novecosky, editor of this blog and editor-in-chief of Legatus magazine, was a guest on Iowa Catholic Radio in Des Moines, Iowa, this morning. 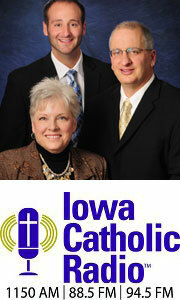 He appeared on the Iowa Catholic Radio Morning Show with Jeanne Wells. She asked Novecosky about the Feb. 22 consistory at the Vatican where Pope Francis created 19 new cardinals. They also discussed the upcoming canonizations of Pope John Paul II and Pope John XXIII.